Cristofori spends the rest of his long life perfecting his invention, coaxing it to respond precisely to a musician's touch. He hopes that someday someone will use it to capture the music of life... [his] invention, eventually called simply the piano, becomes a powerful tool in the hands of brilliant composers everywhere. One of my earliest memories is that of having a piano in our house. My sister's short-lived piano lessons meant that it sat unplayed for many years. But I was fascinated with this unusual piece of furniture in our living room that made noise when I plunked my fingers down on it. It wasn't until I was nine years old that I finally began taking piano lessons, but I can remember as early as three or four begging my parents to learn how to play it. So it is no surprise that this book both spoke to me and fascinated me. As someone who actually spent time during a trip to Vienna touring a piano workshop, it's safe to say that I am the perfect audience for this book. In fact, I couldn't even finish this book before I had to stop in the middle because I immediately felt compelled to go and play my own piano. Not only does The Music of Life tell the story of how the first pianoforte (later shortened to piano) was created, but it also has a lot of great backmatter that includes links that will take you to sound clips of the original Cristofori pianos, which sound much different than they do today. 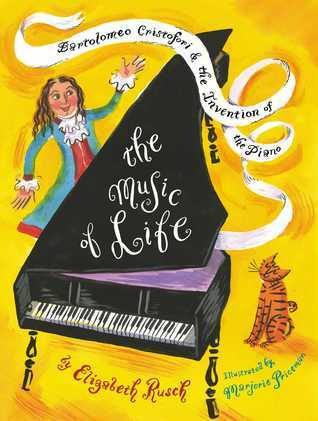 I highly recommend this book for the budding pianist or musician in your life... or just someone who likes to know how things work.